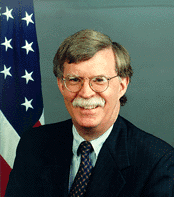 Former United States ambassador to the U.N., John Bolton appeared on Fox News on Thursday, explaining why he believes that the upcoming meeting between Israeli Prime Minister Benjamin Netanyahu and U.S. President Barack Obama is going to be a “very unpleasant” one. The visits of General Martin Dempsey, U.S. National Security Advisor Thomas Danilon, and Director of Intelligence Tom Clapper to the region, he said, are all unremitting attempts at dissuading Israel from attacking Iran. It is more like “an invasion plan of the United States invading Israel, as opposed to dealing with the real problem, which is Iran,” Bolton claimed. The man knows what he’s talking about, but he doesn’t go far enough. Mr. Bolton, the real problem is not just Iran, but the entire compliment of the #HeilObama administration and their hell-bent mission to help destroy freedom anywhere and everywhere they can touch and reach. Also…… Many of us have been imparting the opinion for quite a long time, that as Commander In Chief Of The Armed Forces Of The United States, Barack Hussein Obama, will order the United States military to stop Israel from defending herself. The Joint Chiefs Of Staff and commanding generals are all now his administration’s political appointees, confirmed by the (complicit and now almost irrelevant) Senate. Why does the new Iranian Navy have glass-bottomed ships ? Shimon Peres to meet #HeilObama on March 4th. This entry was posted on Thursday, February 23rd, 2012 at 10:08 and is filed under Main Postings, The Constitutional Watch, The Media, The Second Amendment To The Constitution Of The United States..	You can follow any responses to this entry through the RSS 2.0 feed. You can leave a response, or trackback from your own site. Reblogged this on DEXTER AMERICUS. There should be another group of generals, admirals and statesmen , of the extra-governmental variety, pre-emping the March 5 meeting by going to the American public with a very graphic presentation of what the human costs are going to be to Americans should Obama pesist in impeding Israel, or actually act to deter them from taking out the Iranian threat. Concurrently, a sense of the Congress resolution should be introduced, stating the American people support whatever course of action the Israeli government takes to protectits citizens. “human costs”? How about a picture of the New York skyline with a mushroom cloud over it?